Please refer to our stock # 1899 when inquiring. 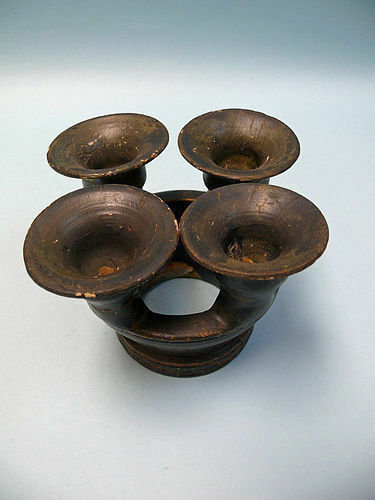 Campanian Teano Ware Kernos with four cups used to hold multiple offerings. Flaring rims set on deep, ridged circular base, Simple decoration of incised lines around bowls and wall of base, rows of dots above and below lips, circa 290 B.C.E., 4" high, pigment faded from aging but in excellent condition. In the typology of ancient Greek pottery, the kernos is a pottery ring or stone tray to which are attached several small vessels for holding offerings. Its unusual design is described in literary sources, which also list the ritual ingredients it might contain. The kernos was used primarily in the cults of Demeter and Kore, and of Cybele and Attis, South Italian is a designation for ancient Greek pottery fabricated in Magna Graecia largely during the 4th century BC. The fact that Greek Southern Italy produced its own red figure pottery as early as the end of the 5th century B.C. was first established by Adolf Furtwaengler in 1893 (A.D. Trendall). Prior to that this pottery had been first designated as "Etruscan" and then as "Attic." Archaeological proof that this pottery was actually being produced in South Italy first came in 1973 when a workshop and kilns with misfirings and broken wares was first excavated at Metaponto, proving that the Amykos Painter was located there rather than in Athens. The kernos was used primarily in the cults of Demeter and Kore, and of Cybele and Attis.